A tiny nonprofit spreads a message of environmental stewardship to thousands of students and adults. Since 2009, Truckee elementary and middle school children have come home with a message for their parents: “Get green!” In their hands were packages of CFL light bulbs, which use approximately 50 percent less energy than traditional light bulbs, as well as hourglass “shower timers” to lessen water use and blue bags for recycling, all handed to them by teenagers in wild outfits through assemblies conducted by Truckee High School’s “Envirolution Club,” which is led by Sierra Watershed Educational Partners (SWEP). Founded in 1994 with a mission to “promote environmental stewardship” and science programs in area classrooms, SWEP has steadily grown the variety of programs it facilitates and the ages it reaches. The Truckee Envirolution Club “Trashion Shows” are the most visible initiative in the local community, but SWEP partners with many organizations and schools to run or participate in ten other programs, teaching science and environmental advocacy to children grades K–8. “Green Teams” in North Tahoe elementary and middle schools are popular clubs mentored by high school Envirolution students. The teams meet weekly to work on projects that combine data gathering, monitoring and language, arts, math and science skills. The overall goal is to instill a sense of civic duty in the students to help create a clean and healthy environment. Shane McConkey Foundation is a major sponsor of the Green Teams. In the fall, SWEP works with the Truckee River Watershed Council to conduct one-hour classroom lessons on native fish. In winter, it partners with the Tahoe Cross Country Ski Education Association to run the Winter Discovery Program, based out of a yurt. Come spring, SWEP joins with the U.S. Department of Fish and Wildlife and numerous state and local agencies that train and support teachers participating in Trout in the Classroom, where students raise endangered Lahontan Cutthroat Trout from eggs and release them into approved streams. SWEP also helps create a number of field days and science fairs, including a popular fifth grade overnight to Truckee’s Sagehen Meadow, where they interact with UC Berkeley researchers. Through this entire spectrum of programs, SWEP has helped fill gaps caused by recent shortfalls in science and art education funding in local schools. But SWEP has also proven adept at reaching a broader audience through the Envirolution Trashion Shows. Club members model outfits they and others have made out of recyclables and off-beat materials, each outfit carrying a specific environmental measure, all choreographed to music. The Envirolution Club has performed throughout the region and beyond, with multiple shows at the California State Fair, international Bioneers Conference in Marin and Squaw Valley Earth Day celebrations. The students have performed on the main stage at San Francisco Earth Day, University of Nevada, Reno, Monterey Bay Aquarium, National Service Learning Conference in Atlanta, and been interviewed by National Public Radio and numerous television reporters. The “wow” outfits of the show include a bubble-wrap wedding dress (its message to use alternative packing material), a yellow rubber glove dress (limit water use and pollutants while doing dishes), shopping bag gowns (plastic trash piling up in the world’s oceans) and bike tire-and-spoke outfits (use alternative transport) right out of a Mad Max movie (or the Playa, to use a more contemporary reference). A busy schedule bringing Trashion Shows to all North Tahoe schools is sponsored by the major public utility districts as part of their mandated efforts to cut energy use in the community. 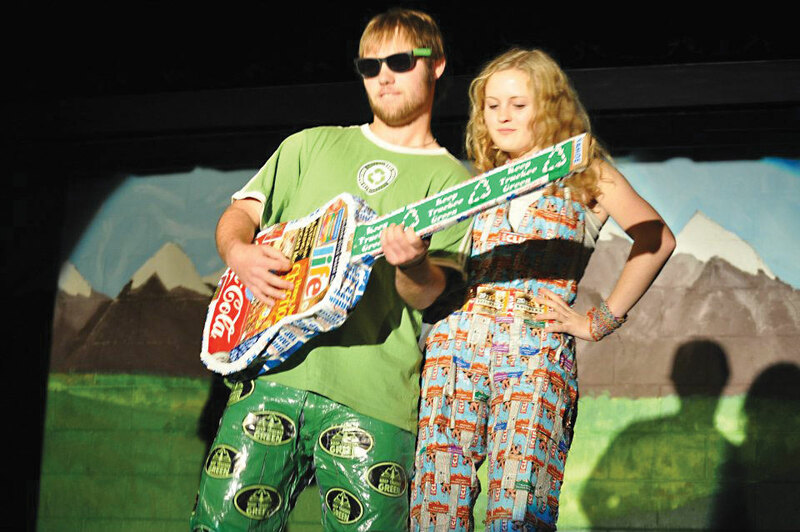 This spring, Envirolution Club performs its first two Trashion Shows at South Tahoe elementary school. “We’re excited to expand the program to South Shore,” says the organization’s executive director, Melissa Mohler, who points out that SWEP already partners with the South Tahoe Environmental Education Coalition on the Tahoe Basin Watershed Education Summit. One of only three SWEP staffers, program director Ashley Phillips implements many of SWEP’s partner programs. The organization was originally formed by area teachers, including West Shore residents Sue Rae Ireland and Toni Rockwell, who were later joined by other locals, to include Meeks Bay fire chief, John Pang. All three have served on the organization’s board of directors for nearly 20 years. Local and out-of-area philanthropists have also donated to SWEP projects, including Tahoe Truckee Community Foundation, Teichert Foundation, Xaton Foundation and Clif Bar Family Foundation. SWEP is backing an initiative to ban plastic grocery bags from Town of Truckee stores, with Envirolution clubbers passing out reusable shopping bags to students. The message is particularly effective when delivered by Truckee high school senior Quina Williams, who stands six foot one inch in heels and a flowing gown of plastic grocery bags, with the accompanying message of “America is addicted to single-use plastic” while background music plays the latest pop hit. One of three Envirolution Club presidents, Williams will be attending Stanford to study physics in the fall, but that is not what has all of the K–5 students in her audience rapt with attention. Ultimately, SWEP’s lasting influence will be students with a newfound environmental stewardship as they move forward in their lives. Some are like Williams, who will soon join a number of Envirolution alumni pursuing science or environmental study degrees in college. But whether the thousands of students who have cheered the Trashion models at assemblies over the last four years just take shorter showers and buy less plastic packaging, or become essential to a new, environmentally-active generation, SWEP is one small nonprofit making an oversized impact on the future. To learn more about SWEP and its efforts, visit www.4swep.org. Connie Dale tries to keep a trunk full of cloth shopping bags in her car in order to spare any embarrassment at the local Safeway.